Departed Goodland, KS during the early morning hours with a preliminary target of Big Spring, TX. The long drive was rather uneventful with the exception of noting tremendous dust devil activity 15 N Big Spring in the vicinity of the outflow boundary. Chased with Derek Deroche (NWS SJT) and Katie Burtis (NWS PIH) and we meandered towards San Angelo for hopeful initiation along the boundary. By late afternoon, several updrafts developed near Sterling City and we casually watched one updraft evolve into a LP supercell. Taking a paved road south out of Carlsbad, we watched the storm continue to organize into more of a classic with a persistent rotating wall cloud. Eventually, the RFD wrapped around the lowering with precipitation slowly shifting around the backside. Low level structure was rather impressive. With time the lowering occluded and became close to producing a tornado as a persistent funnel slowly decayed and became obscured in precipitation. Taking FM853, the structure was pretty with a large hail core and occluded region wrapped in precipitation. Sunset commenced and the storm once again occluded a new updraft and eventually wrapped in precipitation. This particular updraft pulled in copious amounts of dirt with well-defined inflow jets into the occluded region. New lowerings followed by more occlusions continued until it was too dark to observe. We observed several funnel clouds during the two hours, but certainly no tornadoes from our angle. Avoided most of the big hail in the region. 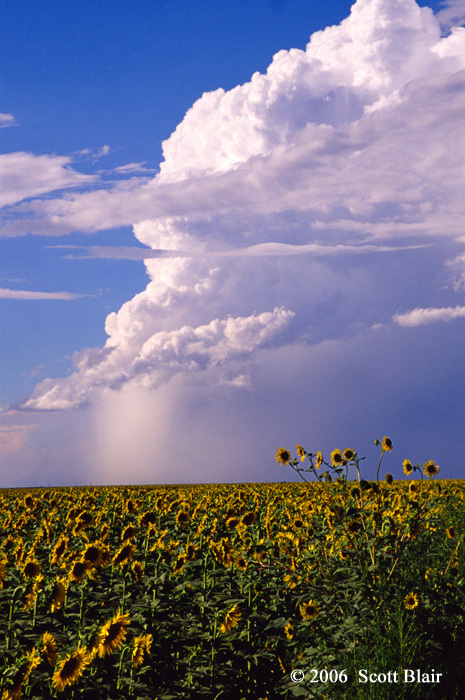 Weak convection developed near Goodland during the late morning. I departed GLD and watched the convection for several uninteresting hours thereafter. I was able to acquire a radar image in Colby and decided to drop south towards new convection developing along the lee trough. A severe warning followed by a tornado warning was issued as I approached the storm in Wallace County. Taking Hwy 40 then Hwy 25, I had a decent view of a rain free base and large core. Sometime between 3:20 pm to 3:25 pm MDT, a tornado rapidly developed unexpectedly under the rain free base, generally 7 miles SE of Wallace. I quickly pulled over and took several stills, then continued to push closer as the tornado roped out and lifted. The tornado lasted for around 3 minutes. A new area of rotation developed and moved into western Logan County around 3:35 pm MDT. This area was quickly hindered by outflow as the storm evolved into more of a bow shape. From 3:45 pm to 3:50 pm MDT, I observed 1.5-1.75 inch hail while driving south on Hwy 25. The storm was clearly finished as a photogenic shelf cloud pushed well ahead of the core. It was certainly a nice, unexpected treat today as conditions didn’t appear very supportive for tornadoes. Perhaps the tornado threat was somewhat heightened near the Wallace region as the lee trough bulged outward around Tribune with surface winds locally backing north of the bulge. There might have also been some sort of west-east boundary near the area from earlier convective outflow? Regardless, I’m happy with the outcome. Lots of driving across western Kansas with four noteworthy structured storms observed during a six hour period. Convection fired along an east-west line north of I-70 around 4 pm CDT. Taking a dirt road north out of Bogue, a severe warned cell north of Hill City came into view. By 5:15 pm, the storm exhibited decent structure with a nice rain free base, well-defined striations, and a persistent lowering. Unfortunately, its fate was quickly sealed from upstream convection seeding the updraft as the entire east-west activity became extremely outflow dominant. By 6:30 pm, I dropped south and watched a nasty bow echo approach Gove. The structure on the south side of the bow was fair, although this storm was overtaken from the surging outflow to its north. One side note, pretty significant wind damage was reported from Gove with tree damage on nearly every block of the small community. A mesonet station which sits slightly in a valley recorded a 67 mph gust. My personal favorite storm of the day came shortly after sunset northwest of Dodge City. Others have described/shown this supercell nicely so no need to regurgitate details. I watched this storm from the intersection of Hwy 283 and Hwy 50 for nearly 45 minutes. It certainly was very pretty structure, complete with an inflow tail and solid lowering. A tornado-warned cell scurried south of DDC around 10:30 pm. I dropped south and watched some fair structure on the back side illuminated by lightning. A much more impressive structured storm developed north of DDC by 11:15 pm. 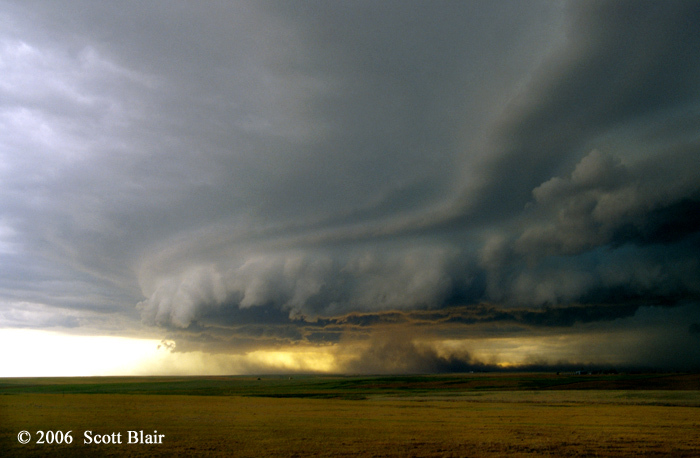 This storm consisted of a highly visible vault region, striations, and a long inflow tail. Shot some slides and made the long drive back to GLD. A good chase day on the High Plains considering the limited shear and depth of moisture. Derek Deroche and I decided to target the eastern Colorado region for initiation as opposed to areas further north based on better easterly/southeasterly upslope surface winds and relatively similar thermodynamic parameters at both locations. Convection fired along the lee trough / dryline by early afternoon. We watched convection struggle and slowly die southwest of Burlington, CO. Opting for new convection and visually in a region with significantly more cumulus oriented east-west, we bumped towards northwest Kansas. 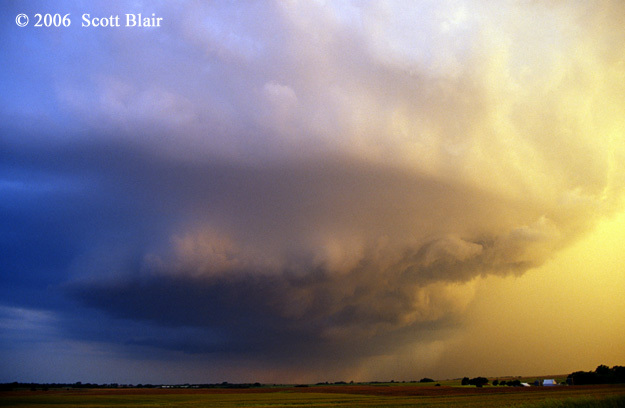 Around 6:00 pm CDT, a new storm rapidly developed and took on LP to dry-classic supercell characteristics. 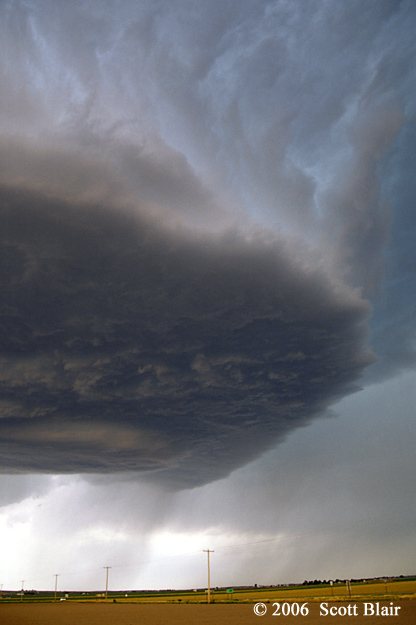 North of Kanorado, KS, the storm exhibited a beautiful circular base, complete with striations and a collar cloud. It was somewhat high based, but provided nearly one hour of pretty sights. Eventually, the storm slowly lost organization and dissipated. Around 8:00 pm CDT, two large storms collided over Trenton, NE. We shifted just south of Trenton, but failed to discern anything structurally interesting in the area. Both storms slowly died, and attention was turned to the southern storm located north of Bird City, KS. This storm continued to organize and provided an impressive multi-layer shelf cloud at sunset. We allowed the storm to overtake us north of Atwood, where we experienced very impressive straight line winds and copious 1" hail. The hail continued into the town of Atwood and especially south of town on Hwy 25 where deep hail drifts, combined with lots of water on the road, made driving a challenge. Around 11:30 pm CDT, we ended the day south of Edson, KS watching a spectacular lightning display to the south from new convection. While not sure of the true lightning frequency at the peak, it was at least several flashes per second. 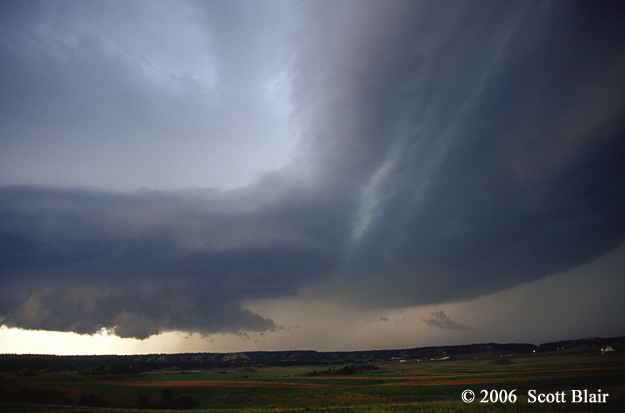 A rather typical day for May 2006 with shallow boundary layer moisture and marginal shear for supercells. Departed GLD with a preliminary target near Alma, Nebraska where we waited for several hours for decent convective initiation. Unfortunately, most activity developed along a cold front resulting in linear, high based storms. Other smaller cells fired east of the mess, but suffered extreme left-splitting that became the dominant mode. We watched several gustnadoes that were mistaken for tornadoes by others in the activity along the cold front. Convection rapidly fired in Kansas shortly before sunset and we shifted south along Hwy281 for a better look. 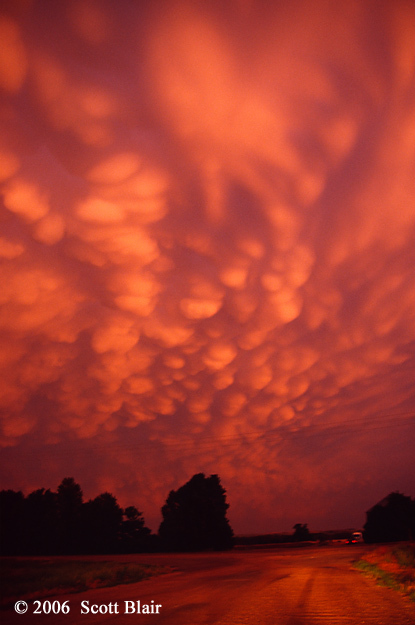 The activity quickly became linear and we settled for a spectacular mammatus sunset south of Osborne, Kansas behind the line of storms. I decided to target portions of northeast Kansas, specifically Clay Center, KS. Earlier convection in eastern Kansas provided one well-defined outflow boundary oriented north-south which intersected the cold front near Clay Center. This region also contained more favorable dewpoint depressions and LCL heights along with backed winds. Convection fired across Washington County, north of Clay Center, by mid afternoon. While these towers quickly exploded, they appeared to be more of a multicell organization. This activity slowly diminished in intensity. After nearly two hours of waiting, new towers exploded east of Concordia. 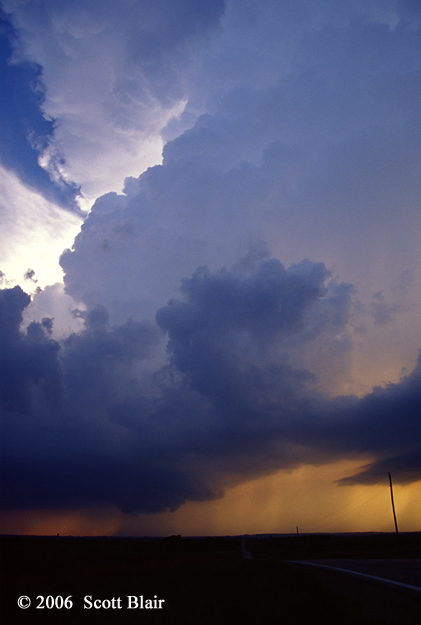 The southern convection quickly became dominant and took the appearance of a LP supercell. The structure evolved very nicely, eventually morphing into a wet classic supercell near Agenda, KS. By 7:45 pm CDT, the supercell was impressive in structure, complete with a vault, inflow tails, and a persistent rotating wall cloud. During the next hour, the storm attempted to tornado but never succeeded from our angle. The first attempt was a blocky cone lowering while the second white cone formed on the north side of an occlusion. The storm eventually trended to linear convection towards sunset as rapid upstream convection developed. A pretty shelf cloud ended the chase near Clyde, KS. It was certainly an enjoyable day with the slow movement and easy road network. Departed Goodland for Las Animas, CO and watched a healthy cumulus field for several hours. Two storms finally became interesting 1) east of Raton 2) west of Limon. I decided to blast towards the northern cell due to better terrain and road options as similar surface kinematic and thermodynamic characteristics existed near both storms. I first intercepted the cell near Arriba, CO. The storm was somewhat low-topped but the lower levels were well organized and surface based. I stayed ahead of the supercell and noted a significant increase in low level organization once the storm moved east of Flagler. At this point, the storm appeared to latch onto an outflow boundary from morning convection and made a right turn towards the southeast. Local mesonet observations showed a very supportive environment with east-northeast winds, temperatures near 70, and lower to middle 50 dewpoints existing across Kit Carson County ahead of the supercell. 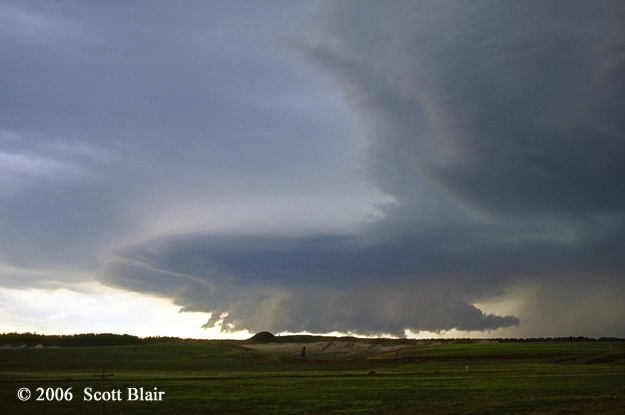 Around 7 pm MDT, I stopped near Stratton, CO to observe the storm structure. Four healthy inflow tails stretched from the northeast and east into the main updraft. The updraft base continued well organized with a small wall cloud and impressive precipitation core (GLD radar 0.5 refl ~76 dBZ). I shifted south out of Stratton and watched the storm tighten cyclonic rotation as a large RFD and associated precipitation core cut south of the rotation. This storm went through two more very similar processes during the next hour, producing several interesting lowerings. Unfortunately each time it appeared the storm was close, the RFD rapidly wrapped precipitation around the rotation and occluded the updraft. 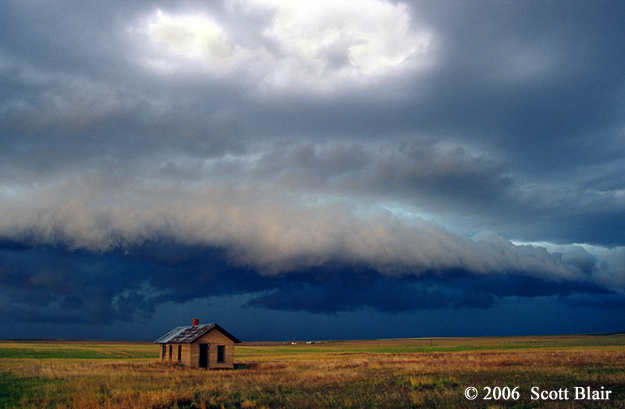 The storm met an abrupt death shortly after 8 pm MDT. We took a dirt road nearly 70 miles from east of Hugo to Hwy 385 while stopping occasionally to observe the low contrast forward flank. From a photogenic standpoint, the day never really began until 5:30 pm MDT when shelf structure finally evolved and contrast improved. Interestingly, a new updraft formed to the east, ahead of the line, along our road in southeastern Kit Carson County. This updraft continued to organize and a large core soon descended from the associated convection. We had watched several updrafts earlier develop and quickly move northeast. However, this particular storm remained anchored as it slowly moved east. Around 6:15 pm MDT, we skirted under the updraft as 1.25” hail wrapped around the backside of the storm. 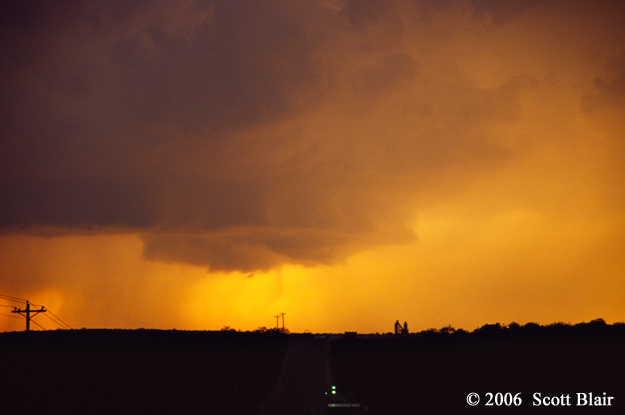 Finally arriving on Hwy 385, we were surprising pleased at the supercell-like structure. The best rotation I personally observed all day was found along Hwy 385 as a wall cloud persisted and teased several with threats of further organization. Visually, it appeared the storm was riding along roughly an east-west and a north-south boundary both trailing into the updraft. Eventually, the activity merged into a nasty bow echo as it moved into Kansas. Heading back north to Goodland, we traversed the leading edge of the bow just north of Sharon Springs. We estimated winds around 70 mph along with blowing dirt/rocks that reduced visibility down to near zero at times. After a rather frustrating chase during the late afternoon hours, good luck arrived just in time for a spectacular show at sunset. Several poorly organized severe storms developed across central Nebraska during the afternoon. The activity was quite high based and quickly evolved into a MCS. We decided to blast south towards more isolated activity in southwest Nebraska and succeeded in observing a fair structured storm with 50mph outflow winds along with a nice rainbow. There was a hint of mammatus covered by low-level scud clouds towards the west, so we quickly shifted westward in hopes for a clear view. 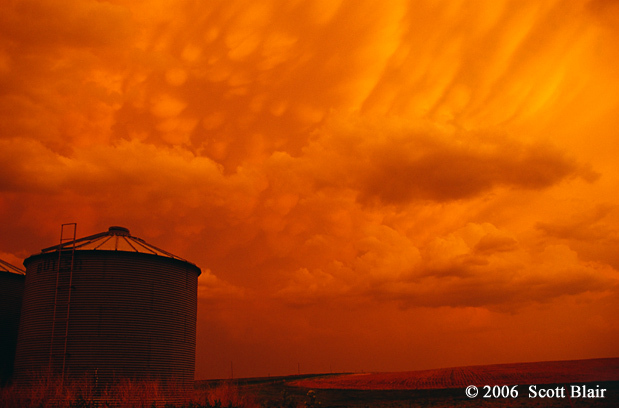 We traversed several dirt roads west of McCook and stopped next to a corn field and windmill to observe an anvil full of mammatus clouds. 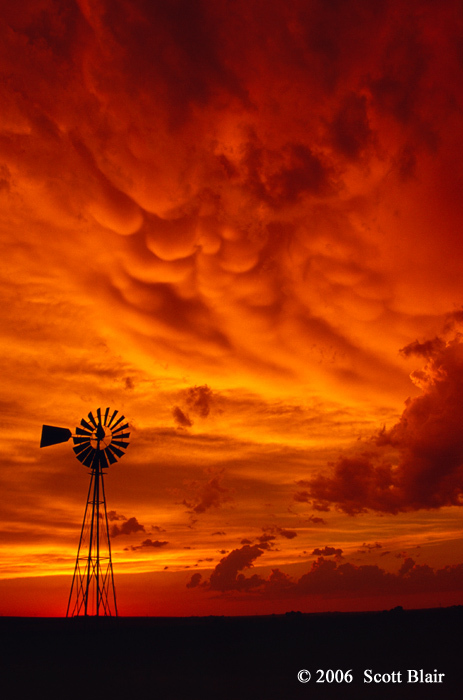 The sky became vivid with the setting sun as brilliant color illuminated all objects in a deep orange. The scene was classic, complete with a cool breeze from the departing lightning-filled storms to the east. Observed three supercells across portions of southeast Montana. Targeted region from Ashland to Hardin due to favorable moist upslope flow and good instability/wind overlap where storms looked to initiate. The first developed by early afternoon across the higher terrain southwest of Crow Agency. 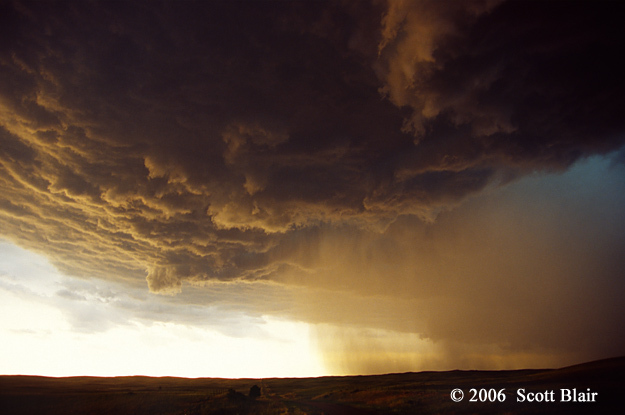 As the storm moved into the more relatively open terrain, it rapidly evolved into wet-classic supercell structure. 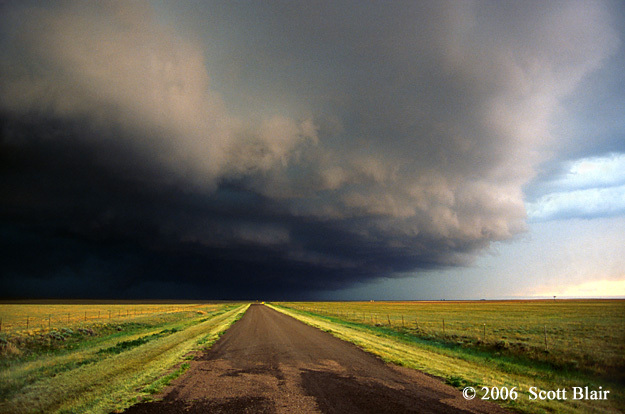 Eventually, the storm lost its photogenic structure and moved into a limited road network. We shifted eastward on Hwy212 to Lame Deer and moved north to Colstrip where a new storm developed towards the southwest. This supercell quickly became well organized and formed a ground-scraping wall cloud along with impressive rotating structure. As the updraft neared Hwy39, it appeared to become outflow dominant. We verified hail size as the cell crossed the road, measuring 2.25-2.50 inch hail size for a ~3 mile stretch on the backside of the storm ~6 SSE Colstrip around 6:30pm MDT. A final supercell developed ahead of ongoing cells north of Volborg just before sunset. The storm originally took upon LP characteristics with pretty structure and a modest amount of lightning. We ended the day in Miles City with sporadic power outages. After a rather pathetic outflow dominant day before, we stayed the night in Scottsbluff, NE. After a leisure breakfast, a supercell rapidly developed by late-morning nearly 20 miles to the west around the NE/WY border. We blasted west to Morrill and then found several paved roads that led south and west towards the updraft. 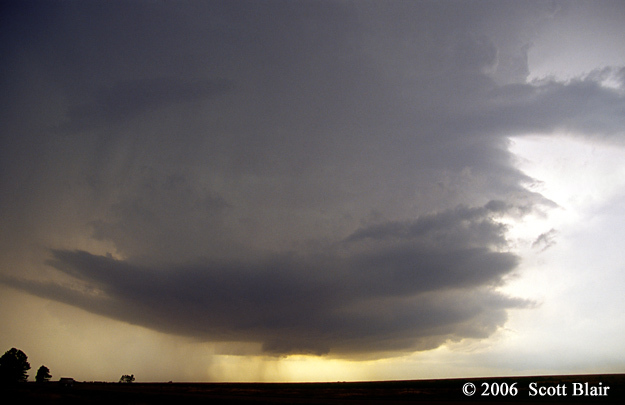 The tor-warned supercell contained fantastic structure and attempted several times to become near-surface based. Unfortunately the storm that held much promise slowly became outflow dominated, high based, and met an ugly demise. We jumped on a new tornado-warned storm in Garden County and followed a one-lane paved road for 40 miles that led towards the updraft. While pretty outflow structure, this storm was far from producing a tornado. Our paved road turned to dirt about the time the core overtook us and we were forced to turn around and take the curvy experience one final time. I strongly dislike chases that peak within the first hour of the day, followed by ten disappointing hours. I didn’t technically “chase” anything today, but was fortunate to observe a tornado from the NWS GLD office. It was a very busy day at work, so time only allowed a 15 second viewing of the tornado from the front door. The tornado visually consisted of a condensed funnel nearly halfway to the ground with a healthy debris whirl underneath. 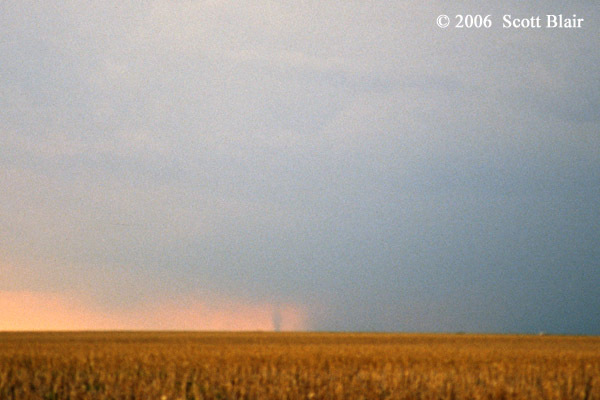 I observed the tornado with a view towards the west-southwest as it was entering the west side of Goodland. Shortly after, the precipitation core slammed the office with a 63 mph wind gust and ~1.50 inches of rainfall within one hour. Two other tornadoes were confirmed with this storm in Sherman County. One ripped off the Dairy Queen front doors and tossed them across the street. Storms initiated relatively late around 6pm MDT in part by a southward sagging outflow boundary moving into decent instability located just west of the CO-KS state line. The cells formed in a friendly moist environment with small dewpoint depressions. 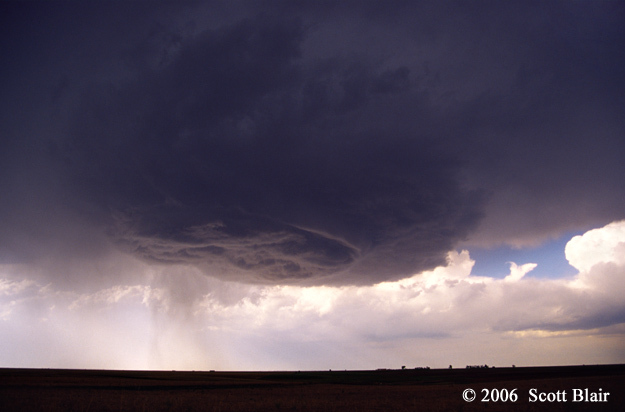 The first storm observed moved into view around 6:45pm MDT near Burlington, CO. This particular storm was an impressive left split from a TOR-warned storm further south. 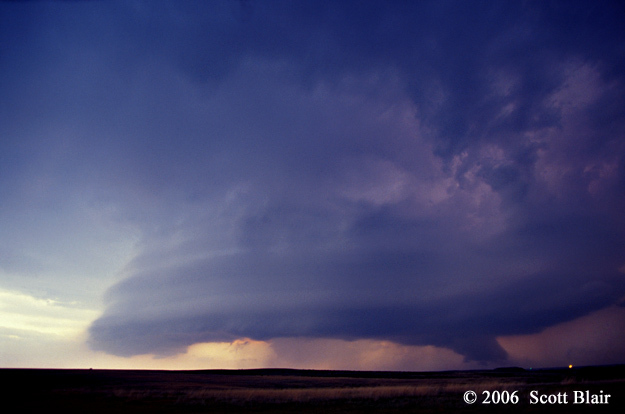 It was virtually a textbook mirror image of a classic supercell; complete with a vault, low LCL height, and laminar low-level inflow tails that stretched towards the south along with mid-level inflow that curved anticyclonic. The TOR-warned storm further south decayed, and my lacking desire to chase a left-split, contributed to shifting attention to another TOR-warned storm to the north along the Yuma-Kit Carson County border. The aforementioned left-split moved into the inflow region of the southward moving TOR-warned storm. Luckily the cyclonic storm survived and rapidly reorganized. I observed the cell north of Bethune, CO for nearly one hour in the same spot as the storm motion was 360 at 5kts. 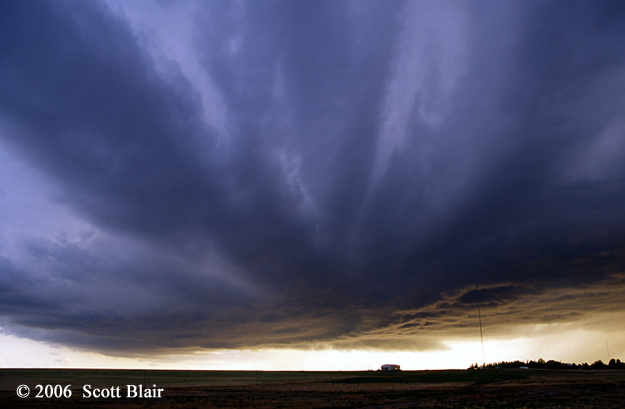 Around 7:45pm MDT, the storm remained healthy with numerous inflow bands feeding in several directions at various heights. A well-developed vault existed with moderate low-level rotation present. A surface observation 20 SE of the storm at KITR was 70/64 with 09008KT. Eventually around sunset, the storm was seeded by other convection and existing instability deteriorated, leading to its demise around 9pm MDT. Overall, it was a good day with beautiful structure and lots of low-level rotation. Left GLD around midday and watched the convective outflow boundary blast through I-70 during my drive to Genoa. I arrived in time to observe a TOR-warned storm near Limon which was strongly outflow dominant in appearance. I dropped south of Genoa and stopped a few miles east of Punkin Center. The storm remained outflow dominant, but was quite photogenic with a multi-layered shelf cloud. 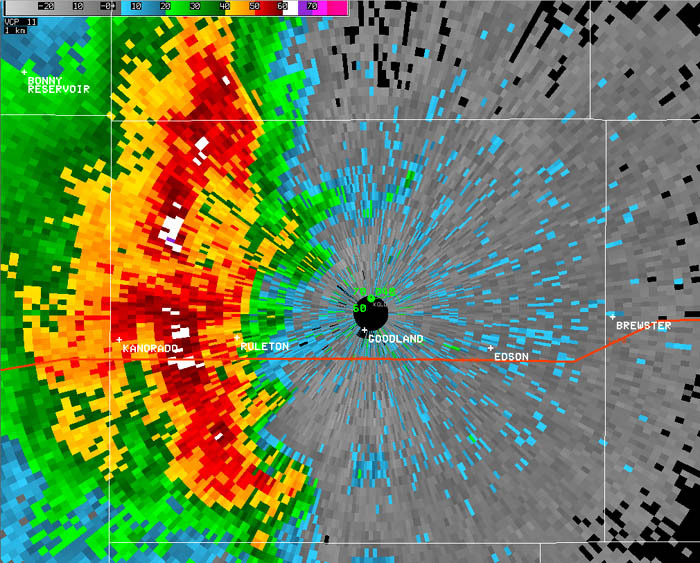 I’m somewhat confident the reported landspouts near Punkin Center, if real, didn’t occur with this main storm. However, I do recall thinking back to the radar that after the main storm passed east of Punkin Center, there was a second area of smaller reflectivity with two intersecting boundaries present going into the updraft region located west of the main storm. I wonder if this might have been the source location of the report. I hope not as I considered taking a closer look at that area, but instead chose to move east to Wild Horse and stay ahead of the layered shelf. Took my fill of shelf cloud photos and ended the day in time for dinner back in GLD. Decent day from a photography standpoint.